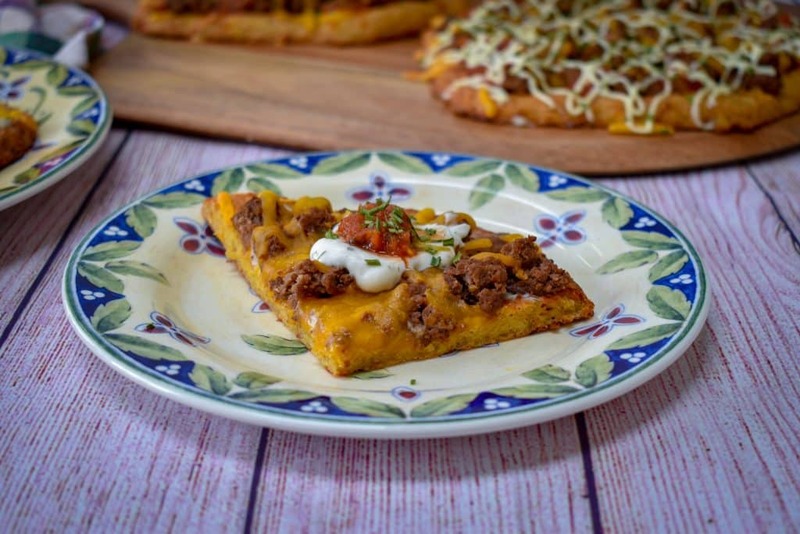 A Keto pizza that is truly low carb and full of flavor, this Mexican pizza is perfect for keeping you full and on track in your Keto journey. 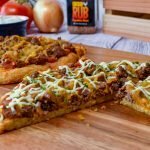 Protein packed and delicious pizza that you will have your taste buds dancing like it’s Cinco de Mayo! 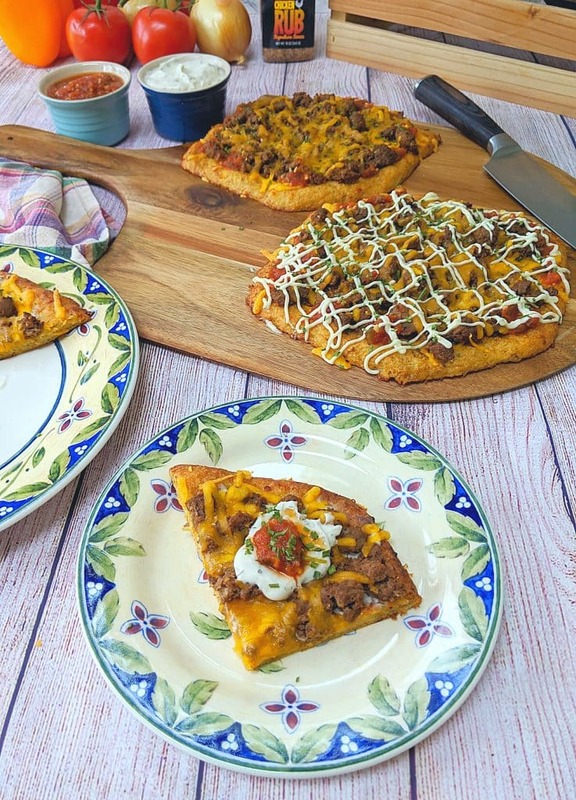 This recipe is dedicated to my favorite school lunch the “Fiastada” AKA Mexican Pizza. whenever this was on the menu at school you could be sure I was buying two lunches that day. Basically every athlete in school was ordering two and most of the wrestlers ordered 3. It’s nothing special, just a oddly shaped hexagon topped with taco meat and cheddar cheese but man was it tasty. I’ve updated this lunchroom classic by replacing the gluten filled crust with a protein packed chicken crust. The flavored are all very similar but without the government grade ground beef served on a flour filled crust. 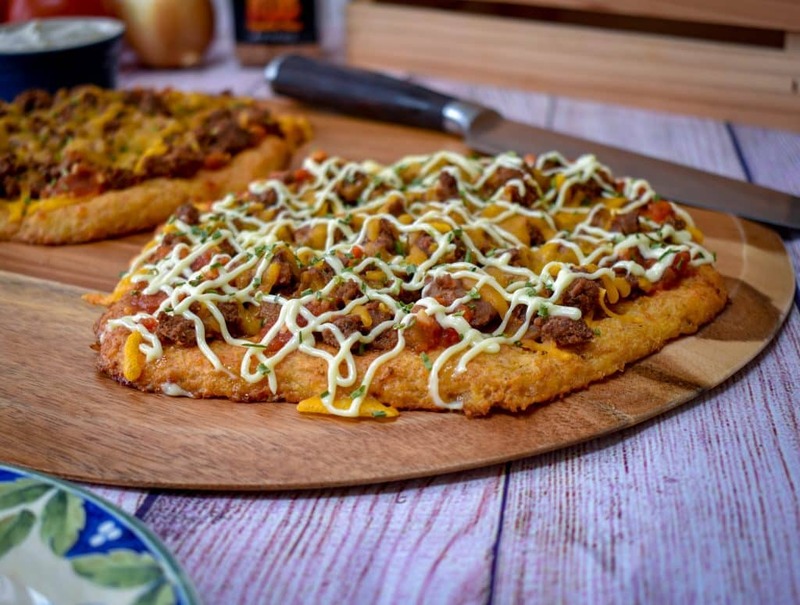 Chicken crust pizzas are one of my favorite Keto friendly substitutes because there are very few ingredients and when it’s done you’ve got a carnivore pizza that you can top with anything you like. 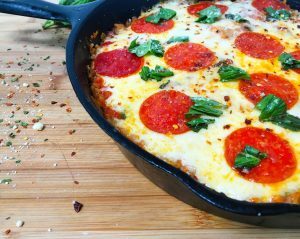 The crust has crispy edges and is plenty sturdy to handle a load of extra meat and cheese on top. 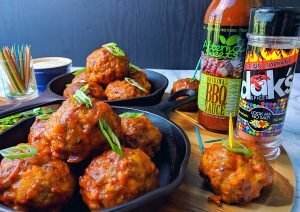 Another benefit of the chicken crust over the cauliflower or fathead variations are the carb counts are virtually zero and you don’t have the bloat that is sometimes a side effect of too much cauliflower. I enjoy all three crusts and do make them but if I’m really trying to watch my macros the chicken crust is my go to for pizza. Pizza Prepping like a boss!! 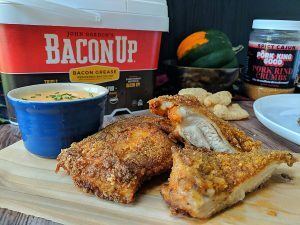 You can use this chicken crust for a variety of pizzas from buffalo or bbq style to a fantastic chicken Parmesan pizza. In the event that I’m meal prepping for the week sometimes I’ll actually triple the recipe and make extra crusts to freeze, all you need to do is let the crust cool completely then wrap in parchment paper and store in a airtight container or freezer bag. Then when you have a hankering for pizza just top it and throw it in the oven for about 15 minutes. Enjoy another one of my classically bad YouTube videos complete with terrible music but at least it’s not baby shark playing in the background. Pre Heat oven 350 Degrees F.
spread out chicken crusts on parchment paper to desired shape, about 1/4 to 1/2 inch thick . Bake for 15 minutes a 350 degrees. F.
while crust is baking sauté ground beef with 1/2 cup of salsa andtaco seasoning until fully cooked. Set aside to cool. 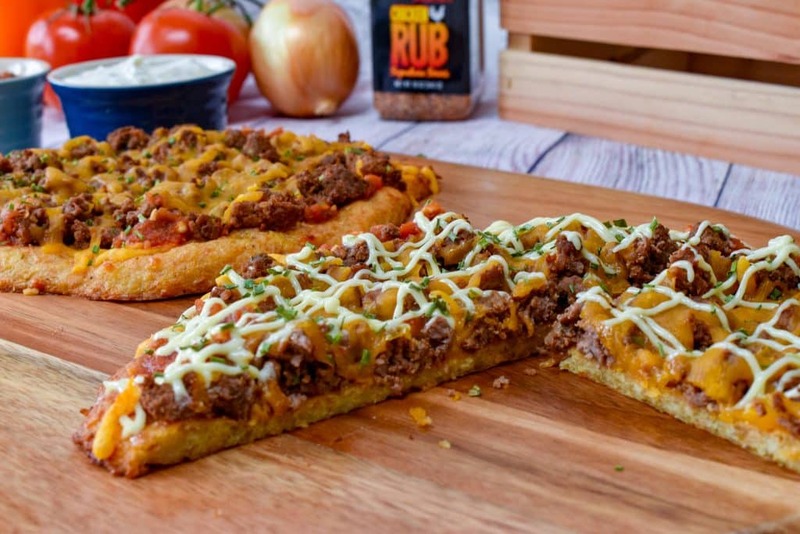 Take chicken crusts out of the oven, brush with remaining salsa and top with seasoned ground beef and cheddar cheese. 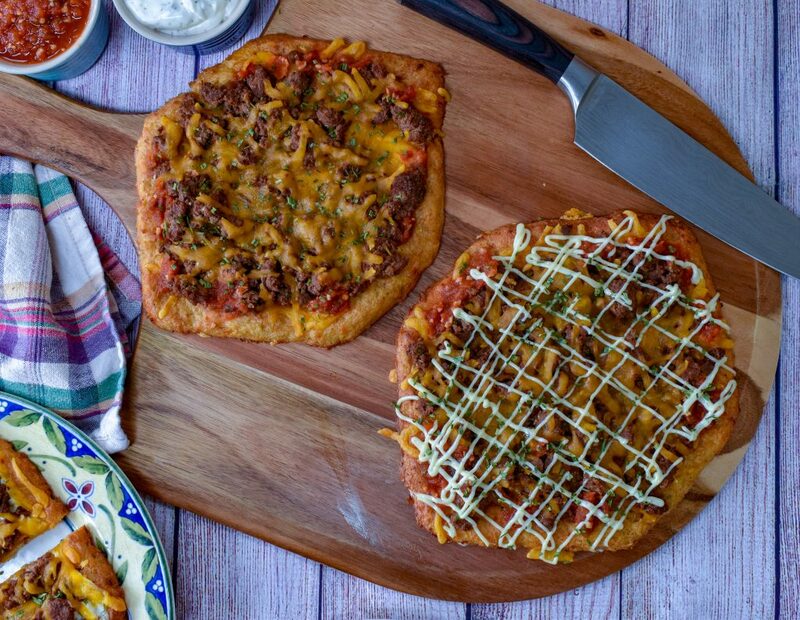 Bake for additional 10 minutes at 350 degrees F.
Slice each pizza into 4 portions and serve with additional condiments like Guacamole, ranch, sour cream and hot sauce.